Do you ever feel as though you would be happy if only things were a little different? You know that happiness is important, but you keep putting it on the backburner because there simply isn’t enough time to prioritize your own inner joy. And at the same time, you know that meditation would help, but you can’t even imagine where you’re going to get the spare time you need to sit still and meditate. In an ideal world, we would schedule moments every day in which to cater to our health needs, because health and well-being are paramount. Yet despite our best efforts we will inevitably face those times when we’re busy every minute of the day. I know I’ve been there. A few years ago I moved country while pursuing life as a freelance journalist. I was working non-stop for a less than minimum wage, and I had zero time to focus on my mental health. Life became unbearably stressful. And while I knew that I could stop the stress if I meditated, I simply couldn’t work out how I would ever get the time to do it. My happiness drifted further and further away. Stress built. Anxiety hit hard. And with zero free time I simply couldn’t find a way out of my misery. I knew meditation was the key. I just didn’t have the time for it. So I made a choice. Instead of meditating the old-fashioned way, sitting still doing nothing, I would find ways to meditate while still being productive. That way I could work on my happiness while still doing everything I needed to do. By simply being present and living in the moment, I could meditate while getting things done. This was a total game-changer for me. Suddenly I had all the time in the world to practice mindfulness because I could do it while still being productive. I was mindful day and night. I would eat meals mindfully, walk mindfully, read my email mindfully… whatever I needed to do I would do mindfully. Suddenly I had gone from having no time to meditate to making mindfulness an integrated part of my life. All mindful moments were helpful at this time. But there were ten mindful practices that I found particularly valuable. And even though today I keep a much healthier schedule and make sure not to spread myself too thin, I still use these practices. Whether you’re going through a busy time or looking for an alternative to traditional seated-meditation, you can use these techniques to boost your mindfulness while saving time. Walking is one of the most relaxing exercises in the world. But it can be all too easy to ruin a good walk by thinking too much. When walking, be mindful of the world around you, paying attention to your five senses. Alternatively, meditate on the feeling of movement in your legs, which is a practice used in Zen walking. Eating mindfully is one of the most wonderful things we do for both body and mind. When we eat mindfully we become more aware of the food we are eating. This makes us more appreciative of food and of the digestive process, and also makes us more likely to eat healthily. Take time eating meals, and focus on the food. 3. In a queue? Meditate. Here’s a great time-saving tip. When you’re in a queue, meditate. You’re standing still doing nothing anyway, and you could be there for a good few minutes, so why not make the most of the time. Close your eyes and focus on your breath. Or, if you don’t feel comfortable with your eyes closed in public, gaze at a wall or something else that is not distracting, and focus on breathing. This is a great way to actually make use of time that would otherwise be wasted. 4. Meditate on the bus. This is my all time favorite mindfulness practice. I’m frequently using the bus in order to help cut emissions, and my trips range from half an hour to well over an hour. That’s time that would be utterly wasted. But by meditating I actually get something out of my time on the bus. Personally, I’m always happy to sit with my eyes closed and look a little bit funny doing so. But if you prefer not to draw attention to yourself, keep your eyes open and simply drop your gaze to a forty-five-degree angle. Now focus on your breath. 5. Exercise with body and mind. Oftentimes when we’re exercising the body thoughts are still ruminating in the mind. Big mistake. Physical exercise can be used as training for both body and mind. All we need to do is focus while we exercise. Some exercises are more conducive to this than others. Yoga, tai chi, and Qigong are all excellent mind and body exercises, and running can be another good choice. Other exercises such as weight-lifting and competitive team sports are less appropriate. 6. Actually watch the TV. How often do we have the TV on without actually focusing on it? We’ve got some random show playing in the background while we’re thinking of what to make for dinner or what we have to do at work. This creates a rift between our reality and what’s occurring in the mind. And this is detrimental to mental health. When watching the TV, actually set aside an hour or so in which to genuinely watch a show. Focus on the show. And when it is over turn off the TV. 7. Lie down in body and mind. Lying down is, of course, an act of rest. But too often when we lie down we rest the body while still working the mind. How many times have you gone to bed worrying about the next day? Such moments are not genuine rest, and they certainly are not conducive to good sleep. When lying down with the body, we should lie down with the mind too. To do this, focus the mind on the body. Focus on the body at rest. Begin by focusing on the crown of your head. Notice what sensations are there. Is there any tension? If so, imagine breathing fresh air into that area. The fresh air relaxes. It carries away the tension. Once the crown of your head is relaxed, move down to your forehead and repeat the process there. Continue one step at a time, progressing through your eyes, nose, mouth, neck and so on, all the way to your feet. Your entire body will now be utterly relaxed. Focus on it. Be mindful of your entire body. Particularly be aware of the sense of relaxation. Keep the mind there, your consciousness evenly spread across your whole body. This is lying down in mind as well as in body. It is an immensely relaxing experience and one of the best ways of refreshing the mind. Everyone loves a good listener, and listening can be an act of mindfulness too. All we need do is pay absolute attention to the person speaking. When doing this, we do not judge their voice or what they are saying, and we do not worry about how we are going to respond; we simply focus on the sound of the other person’s voice. Let’s be completely honest, most of us do not focus on work 100 percent unless the boss is standing next to us. Instead, we’re thinking about how we want to get out of the office, how we’d rather be at home or out having fun. But dreaming about not working while we’re at work simply makes us miserable. When we focus the mind 100 percent on the work we’re doing we come to actually enjoy our jobs. So, when writing, write. When selling, sell. And when listening to that angry customer’s complaints, listen. This will stop work from feeling like a chore and make it a pleasurable, mindful experience. 10. Listen to the kettle and meditate on the drink. One way to make a cup of tea or coffee even better is to meditate on it. Meditate on the sound of the kettle when it is boiling. Focus on the process of making the tea or coffee. And drink mindfully. This will make you appreciate the drink more, while also increasing present-moment-mindfulness. Mindfulness needn’t take time. We can be mindful while doing the things we need to do. And in the process, we can boost our happiness and health without losing time. 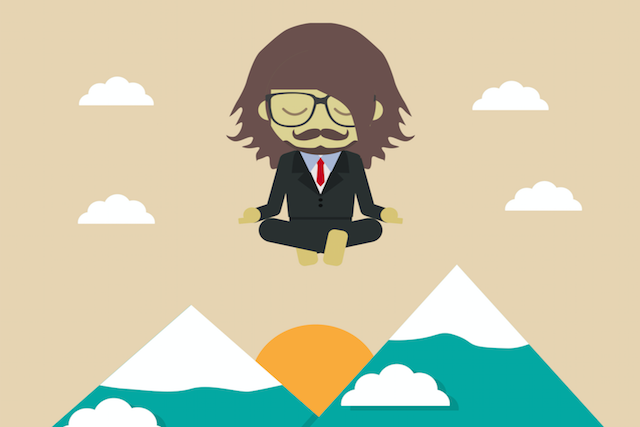 The ten tips we’ve looked at provide ways to boost mindfulness while saving time. And there are many similar tips. What is your favorite way of being mindful? Paul Harrison is a meditation teacher based in Hamilton, Ontario, Canada. He has read hundreds of books, attended lectures, spoken with gurus, and learnt everything there is to know about mindfulness and meditation. He shares his wisdom in the inspiring and enlightening book Journey To The Buddha Within You and in his guide to 31 different ways to meditate. The post Boost Your Happiness: 10 Mindfulness Tips for Busy People appeared first on Tiny Buddha.